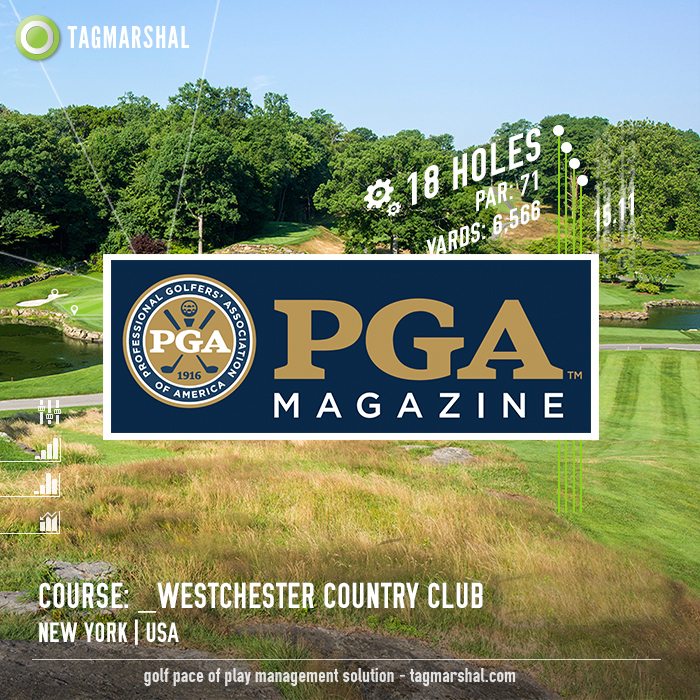 PGA Magazine interview with Ben Hoffhine, PGA Director of Golf at Westchester Country Club | Rye, New York. Westchester Country Club in Rye, New York, is a busy place in the summer. PGADirector of Golf Ben Hoffhine says the 45-hole private club logs more than 50,000 rounds a year, sometimes doing up to 450 rounds in a single day. Pace of play is important to keep members and their guests happy. Hoffhine, who is in his second year at the club,has turned to Tagmarshal to monitor pace of play. Hoffhine said a trial run with the tracking product in the fall of 2017 identified problem areas and will help the club improve pace of play in 2018. Tagmarshal uses small “tags” clipped onto golf bags or installed on golf cars that transmit geo-location data back to the clubhouse. Algorithms identify groups having trouble keeping up, as well as trouble spots on the course that slow down regularly. A recent USGA survey showed 74 percent of players believe appropriate speed is critical to enjoyment of their rounds. Westchester joins other well-known courses such as Carnoustie Golf Links in Scotland, The Ocean Course at Kiawah Island (South Carolina) Golf Resort, Wisconsin’s Whistling Straits and Erin Hills, East Lake in Georgia and Valhalla Golf Club in Kentucky in adopting Tagmarshal to help alleviate slow play. Hoffhine says Tagmarshal’s ability to track walkers was critical for Westchester. Walking golfers who take caddies must mix with groups riding in golf cars throughout the day. Hoffhine says the goal for this season is to keep pace of play under four hours for tee times before 8 a.m. and 4:05 for rounds the rest of the day, down from 4:10 last year. Tagmarshal, the industry trusted Golf Course Intelligence system achieves results across daily fee, private and resort facilities that offer cart, walking or dual mobility. Improved operational efficiencies, improved and consistent pace of play, additional revenue and a better golf experiences are the objectives course owners and managers successfully target with the system.